They said it couldn't be done. They said it probably shouldn't be done. But, Pizza Hut is attempting the impossible. A real-life, massive, 12-foot-tall pizza throwera la Teenage Mutant Ninja Turtles. This baby is gonna be big. And it's going to be delicious. And people are probably gonna get hurt having pizzas hurled at their cosplaying faces. But, goddammit, it's gonna be glorious. 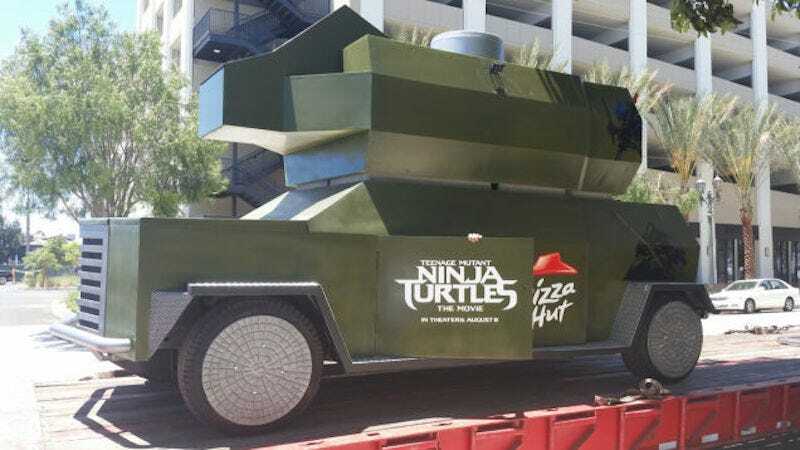 According to The Mary Sue, the thrower is being built for Comic-Con, and I'm not positive, but i'm preeeeeetty sure it's there to promote Michael Bay's new TMNT film...and Pizza Hut. Here's where to see video of how they made the crazy contraption and even more outrageous photos.